The magic dragon guards the rose hill planted all around with 30,000 white and pink roses in our Family-Garden for many years. Since the dragon lays on an overgrown hill, it can only be observed from a distance. 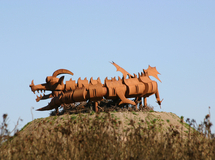 The design of the imaginative sculpture is by the metal sculptor Eckhard Herrmann. 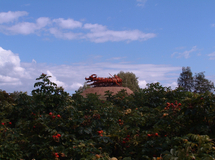 The artist was born in Finowfurt and has his studio in the „Blechenhaus“ in the Family-Garden Eberswalde.